“I haven’t bought canna lilies in years because they multiply,” said Kristen Suto of Busti Avenue, Buffalo. 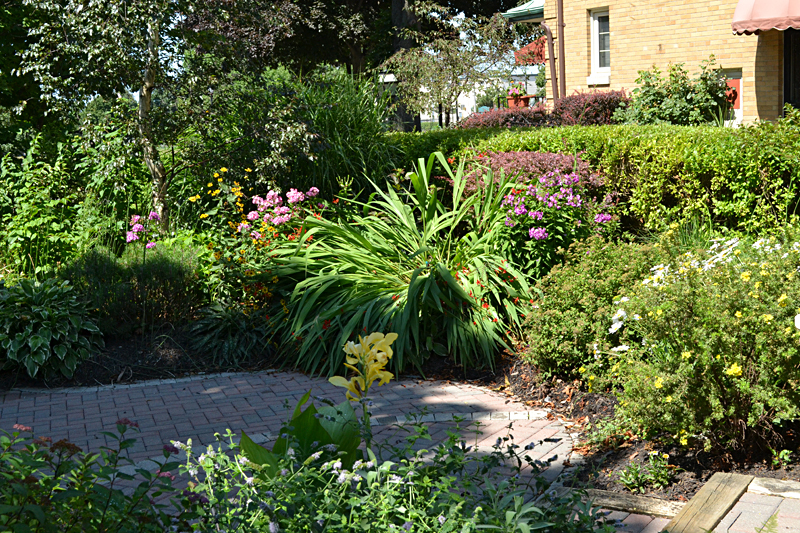 We visited her lush front yard, which has a view of the Niagara River, during Garden Walk Buffalo in July. Suto has canna lilies in pots and in beds throughout her gardens. The yellow flower in the photo below is another canna lily. 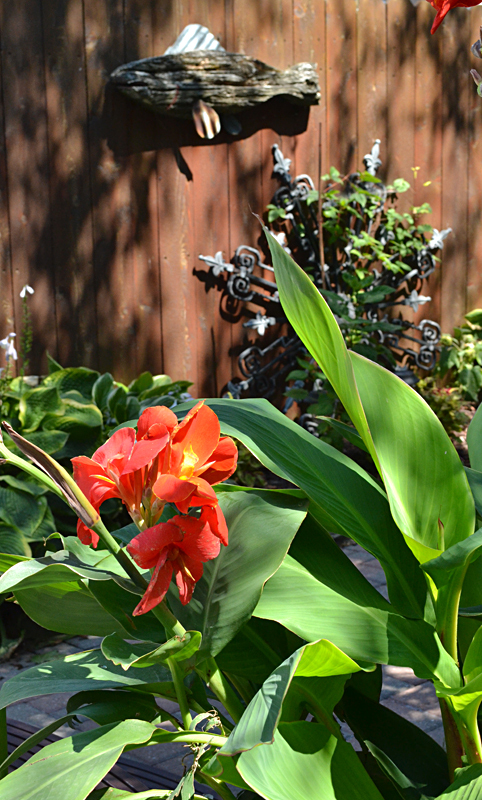 If you haven’t already brought in your canna lily bulbs for the winter, do it now. When Suto brings her canna lilies inside in the fall, she trims off the excess leaves. “The leaves don’t do anything in the winter,” she said. She keeps about six inches of stem. Suto places the bulbs in a black garbage bag and loosely closes the bag. She keeps the bag in the basement. In the spring, the plants begin to grow and will push open the bag. 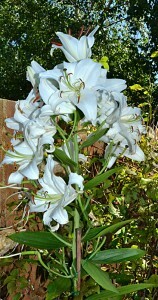 Replant them in a pot or in the ground after the last frost. Here’s another tip from Suto: In late winter or spring, many of us get a pot or basket of blooming spring flowers. When the plants have lost their blooms, don’t throw the bulbs away. Instead, plant them in your garden to get flowers the following spring. 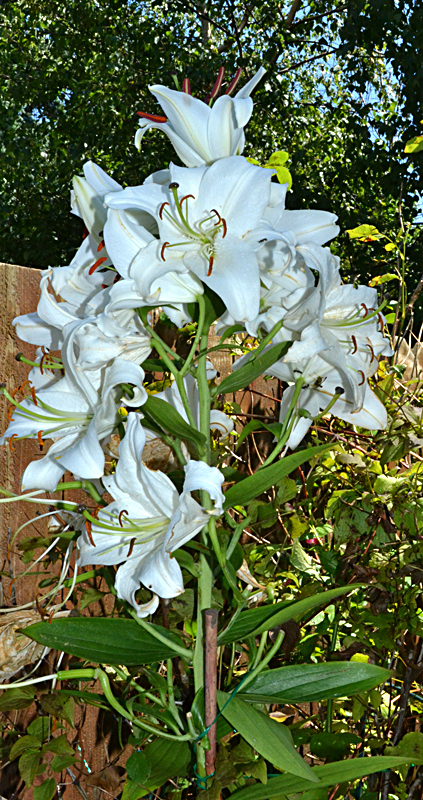 The huge, fragrant white lily in her garden at left started out as an Easter lily, Suto said. I was given yellow tulips one year and they’re still coming back in my garden. This will work with daffodils, hyacinths and other spring bulbs. 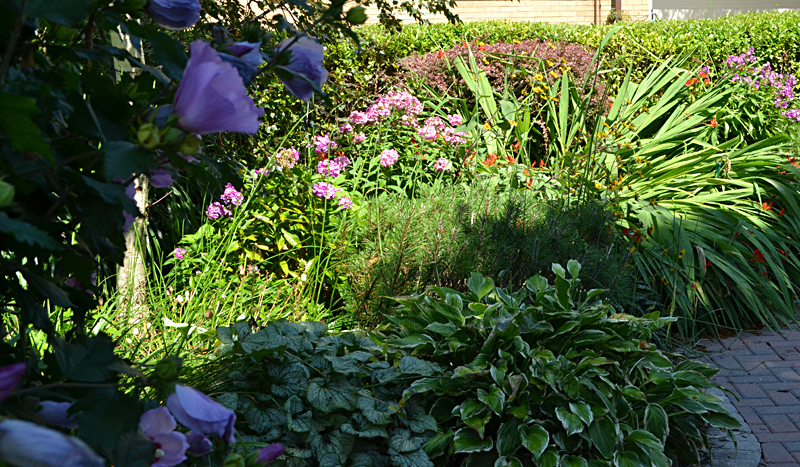 The last photo is a view from a shady area of Suto’s garden looking into a sunny area. Suto offers one last tip on how she keeps her garden beautiful. Even if that doesn’t help the plants, I think it’s a great way to improve the mood of the gardener. Bulbs are so easy to over-winter and Canna is really worth the effort, like she said they readily multiply. I think a lot of gardeners may not know what you have to do. As you say, it is pretty easy. Canna lilies are magnificent plants. Canna also makes an excellent houseplant. It is unfazed by the dry, indoor air, but needs lots of water. Potting in containers with no drainage helps keep them as moist as they like to be. In early Fall, I separate the small “babies” that form next to the parent plant, and pot them up. Then gradually adjust them outdoors in the Spring, and they have a nice head start for the summer season. I didn’t know that. What a great tip! Thanks so much for sharing. you are so right, cannas are so worth the effort. My neighbor gave me some last year,I kept them in the cellar in a bag and this year they were spectacular!! I think you folks have convinved me that I need to plant some cannas next spring!